Sometimes we may need a specialized data logging platform for our IoT devices. So, for that Phant is here, an open source data logging platform with highly customizable data fields. 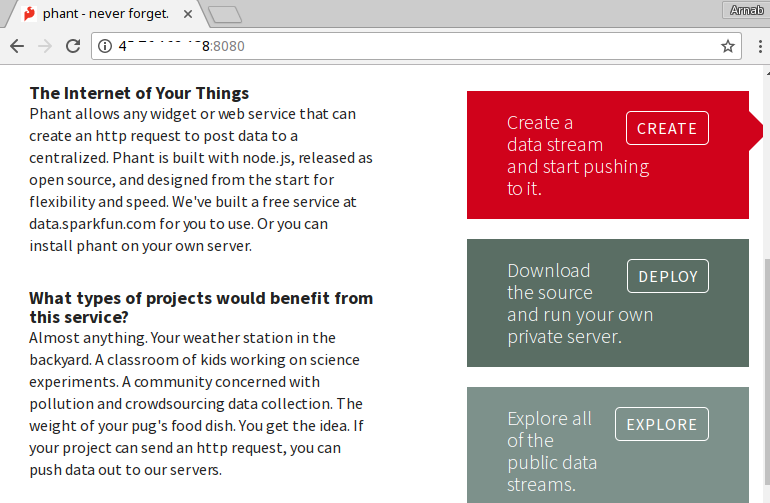 It's a node.js based application, developed by SparkFun. Here we'll install and configure Phant on a fresh Ubuntu 16.04 server, logged in as root, so we'll not use the sudo command. First we've to update all the packages to make sure old packages are not conflicting with something later. Now we'll install nodeJS and Npm, the default version available in the Ubuntu's default repository works pretty well here. The above command will take a little time to complete. A little tweak is still needed, symlinking nodejs binary to node. Check the node and npm version to be sure. As stated before, it's a node.js based application, so we can install it easily with npm. That's all we need to do. You need to know the public IPv4 address of your server. Most probably you already know it, if not just run curl -s v4.ident.me We'll not be using IPv6 to keep this tutorial simple. To start the test server, just run the phant command. Now point your browser to the http://your_public_IP:8080 URL, you should be able to see the front page of Phant. 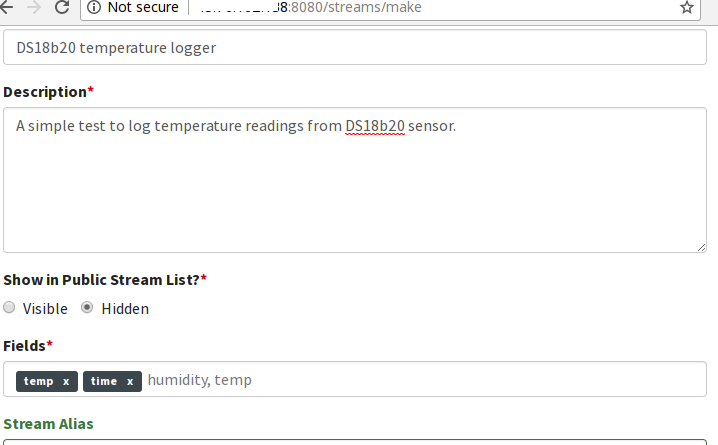 Now you can create a stream for testing purpose, It's very easy, and save the Data stream details in some safe place. Everything is explained in detail in the final data stream configuration page, pretty self-explanatory. So we won't be discussing much about how to use the Phant platform. Now we can post some data through the cURL command, An example below. You should get 1 success message after successfully completing a data submission. Instead of cURL, you can use any command or application which is capable of sending HTTPS or HTTP requests. 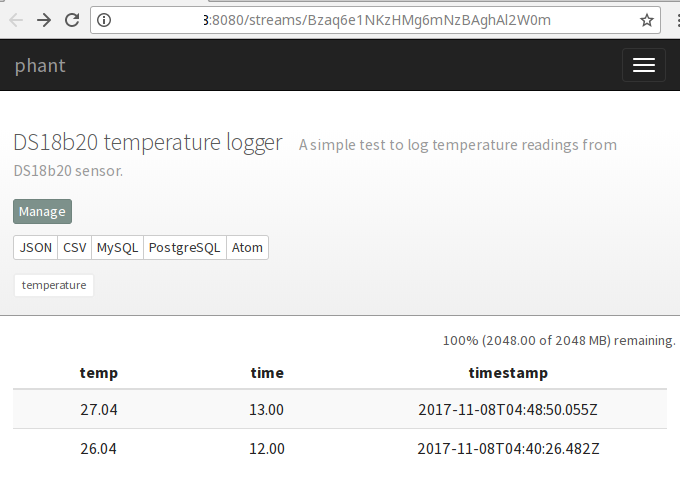 A sample of logged data in the screenshot below. Below the systemd service file, just copy paste it. If the phant server killed by something, it will be started automatically As we're using the Restart option in the systemd service file. You might be interested more about how to write systemd rules, follow the link. Finally start the phant server and enable auto startup through systemd. Systemd and Phant logs are available in the /var/log/syslog file, if you need to debug. This step is totally optional, but I think a public facing NodeJS based server isn't a great idea. So, for that we'll be using the NGINX web server to act as a reverse proxy for the Phant application. Edit the default nginx configuration. Below a sample NGINX configuration, don't just copy-paste it, modify it according to your need. If you have a domain name, then enabling SSL with Let's Encrypt is easy. But there another way, a self signed SSL certificate. Though there's nothing wrong with them, but browsers love to show a warning page. I'll be using a previously registered domain for this test, but you can register a .tk domain for free. There's no generic way that how you setup your domain's name servers. But the ultimately at least one A record of the domain should be pointed to your server's external IP address. However I prefer to use CloudFlare, it also provides an extra layer of security to the application, and it's super easy. Here's more details. The above commands will automatically fetch the valid SSL certificates and add extra configurations to the default nginx config file. Finally we need to reload NGINX server with the service nginx reload command. To automatically renew the certificates, add a cron job entry with crontab -e command. After setting up all of this, we can access our Phant server over HTTPS. If everything was done properly, we should be able to access the secured Phant application just by typing the domain name in the browser's URL bar. Of course we don't need the port 8080 open to use the Phant server through NGINX. So it's better to hide it. We'll be using the pre-installed ufw firewall app for this purpose. As the OpenSSH server is white listed, there's a very little chance of loosing SSH access after enabling UFW. So, that's all about how to install Phant on Ubuntu server, and secure it with SSL, NGINX and ufw. I hope it's simple enought ho understand, leave your suggestions and questions below.